Federation Square turned navy, crimson and jade for the 2019 Melbourne Vixens Fan Day, thanks to the City of Melbourne. With two weeks to go until Round 1, thousands of Vixens fans descended on Federation Square to countdown the days until the season opener between the Vixens and Queensland Firebirds. 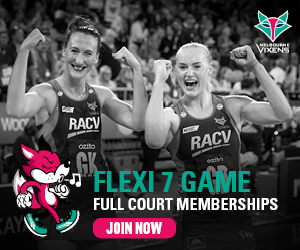 Fans were treated to giveaways and activities from the Vixens' valued partners, with meet and greets with the players and presentations of the 2019 dresses to the team. The event would not be possible without the support of the City of Melbourne. The Vixens head to Perth tomorrow for their final pre-season hit-out before the Round 1 clash at Melbourne Arena. Tickets to Round 1 can be purchased here, with access to the Collingwood Magpies vs Sunshine Coast Lightning game straight after.